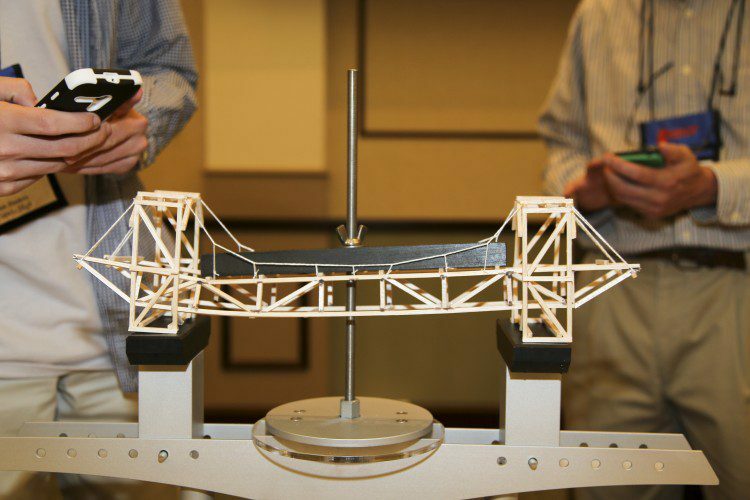 Jackson, Miss., May 12, 2015—Four teams from North Mississippi are preparing to compete in the National Transportation and Civil Engineering (TRAC) Bridge Building competition on Wednesday, May 13, in Cheyenne, Wyoming. The TRAC program introduces students to a wide variety of career opportunities in the field of engineering and teaches students how to apply math and science concepts to help identify and resolve engineering barriers in the transportation system. Representing Mississippi in the 7th and 8th-grade division of the 2015 Bridge Building competition is the Tupelo Rad Clad from Tupelo Middle School and the Dixie Builders from Guntown Middle School. The Bridge is B.A.E. team from East Union High School and the Tachie Tech Bridge Builders from Mantachie High School will be representing Mississippi in the 9th and 10th-grade division of the competition. Initially, the Mississippi Department of Transportation (MDOT) provided each team with a TRAC Challenge Entry Kit, materials and guidelines to construct a bridge. Each participating team then submitted a portfolio with their bridge design, a PowerPoint presentation and the strength-to-weight ratio of the bridge. The competition is another way to showcase how Mississippi’s students are learning about transportation while studying science, technology, engineering and math. For more information about the TRAC Bridge Building Challenge competition or the TRAC program as a whole, please contact the MDOT Public Affairs Division at (601) 359-7074 or Linda Clifton, National and Mississippi TRAC Program Manager, at (202) 624-5267. For more information, visit GoMDOT.com.